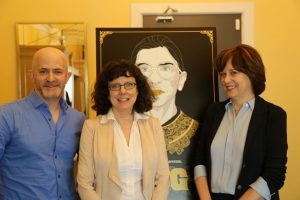 I met with directors Julie Cohen and Betsy West on Thursday, April 26, 2018, in Washington, DC, to discuss RBG, their documentary (which I also reviewed) about the great feminist jurist Ruth Bader Ginsburg who, in 1993, became only the second woman to ever be appointed to the United States Supreme Court. Still going strong at 85, she is a paragon of vitality and strength, following a disciplined workout regime and staying up late to work on judicial cases. Cohen and West have created the definitive cinematic portrait of this inimitable titan of American jurisprudence. Here is a condensed digest of our conversation, edited for length and clarity. Hammer to Nail: So, Julie, this is not your first film as a director; Betsy, it is your first film as a director, though you have produced many films. What brought you two together? Julie Cohen: Well, in some ways Ruth Bader Ginsburg is part of our connection. Betsy and I first started working together when she hired me to work on a massive project she was doing called Makers, which was a whole history of the women’s rights movement, for PBS, and it was on that same project that Betsy did an extensive interview with Justice Ginsburg. Later on, I did a shorter interview with Justice Ginsburg for a film I made called The Sturgeon Queens, and that led to the Justice as a big conversation piece between the two of us, just as Justice Ginsburg kind of rose to rock-stardom, unexpectedly, among the millennial generation. It just led us to think: a) someone needs to make a big documentary about Ruth Bader Ginsburg; and b) why shouldn’t it be us? Betsy West: You know, we realized that many of her millennial fans and other admirers didn’t know the entire story. The fact that she was a crusader for women’s rights, that she won rights for women, under the constitution, in the 1970s, as a young lawyer arguing before the Supreme Court, and also that she had an amazing personal story with a great romance, to boot. 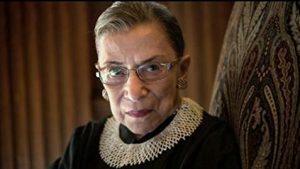 HtN: So, speaking of teaching people things that they might not have known about Ruth Bader Ginsburg, was there something that you learned, in the making of this film, that was news to you, or particularly surprising to you, in her biography? BW: I think we knew the outlines of the story, but there are two things that surprised us. First of all, her determination throughout her life…how she met every single challenge, beginning with graduating from the top of her Law School class, and not being able to get a job because of discrimination against women, her husband getting very ill…and then, how she figured out a way to help both herself and other women by challenging discriminatory laws. Every time she faces adversity, she just pushes through! And then there’s her legendary workout: she does the pushups, the planks, lifts weights. She’s doing that to keep herself in shape, as an 85-year-old, to do the job she loves. That’s #1. Julie can talk about the extent to which we understood how her marriage affected her life. HtN: I just want to say that one of my favorite parts of the film is her workout. BW: We can talk a lot about what it was like to film Justice Ginsburg in the gym! We had actually told our camera crew, going in, “Whatever happens, just keep rolling. We don’t know what this is going to be, but roll the cameras and we’ll figure it out later.” (laughs) Well, they rolled for 30 minutes straight, of her hour-long workout, and it was like she didn’t let up for even a minute. She did a workout that was beyond anything that we could do, and was so single-minded: she didn’t look at the cameras, didn’t look over at us. She just looked at her trainer, he told her what to do, and she kept doing it. At one point, she was pulling on some stretchy bands, and she went, “These are a little light! Could you get me something heavier?” (laughs) It was pretty fun and inspiring to watch. HtN: I jumped in with that comment just as you were going to talk about their marriage. Did you want to talk about that? BW: Ruth Bader did something smart when she was a young woman: she fell in love with a man who admired her not only for her beauty, but for her brains. Marty Ginsburg was bragging about his wife when they were both at Harvard Law School, saying, “Hey! She’s going to be on the Law Review!” He realized how brilliant she was, and he wasn’t threatened by that. He was a lawyer himself, and a very successful lawyer, but he knew that the work she was doing in the 1970s, in the Supreme Court, arguing gender-equality cases, was important. At some point he recognized that she had the caliber of legal thinking that meant that she should be on the Supreme Court. So, when an opening came up in 1993, it was Marty Ginsburg, who was a very likeable, affable guy, with many connections in Washington, who lobbied for his wife. And many people say that he got her to the top of the list. JC/BW: (together) It was a very smart choice! BW: (laughs) I don’t know if it was luck or strategy! HtN: (laughs) And they fell in love…there’s always that. HtN: So, since Ruth Bader Ginsburg is such a great champion of women, can you talk about how you assembled your crew? It’s an all-women crew, and you’ve got Carla Gutierrez as your editor, Claudia Raschke as your DP [Director of Photography], and Miriam Cutler as your composer. Could you talk about bringing them together? JC: Absolutely! It’s a tough decision to make of who is going to be the top-level creative people, and we made a decision pretty early on of “let’s go for women in the lead creative positions.” It just seemed like, “We’re women, we’re making a film about a woman…how about hiring some women?” Not that we didn’t have any men working on the film. We did have some men, but the key creative roles, and also – as a happy happenstance – also the three executives from CNN Films, who picked up this film and guided us through the process, were women, as well. So, we did do it a bit on purpose, and I think it worked out fantastically. I think we had more fun during the making of the film because it was a team of ladies. BW: We had a great time! Especially once we had done all the filming. It was kind of nerve-racking, in the first year of filming, making sure we were going to get the access that we needed, but once we’d done the interviews, and done all the filming with Justice Ginsburg, and interviewed her, the final two months of putting the film together were really a joy. We had a lot of fun. HtN: Well, you picked good people, because the film is quite well made. They were clearly the perfect choices. So, you have a lot of well-known people in your film, like Nina Tottenberg and Gloria Steinem. Were there any people that it was particularly difficult to get interviews with, or people that you wanted – you don’t have to name names – but couldn’t get for your film? Or was everyone just super-cooperative, given who it’s about? JC: Not naming names, but yes, there were a couple we tried, but didn’t get, but don’t feel like we’re missing them greatly in the film. Overall, it’s a testament to our subject that people were quite eager to talk about her. It’s kind of a well-known fact of booking for documentaries and news that very big-shot people often don’t want to give interviews about subjects other than themselves. People made an exception for Ruth Bader Ginsburg. Bill Clinton, Orrin Hatch, and Gloria Steinem, particularly, don’t give tons of interviews that aren’t about their main projects, but they were pretty eager, not that they booked quickly, to say what they had to say about Ruth Bader Ginsburg. BW: Yeah! People are proud of their association with her, and they admire her so much. Gloria Steinem was the face of the women’s movement, but behind the scenes, Ruth Bader Ginsburg was the legal architect of the women’s movement, and Gloria knows that. She’s known Ruth Bader Ginsburg for years, and I think was happy to see her get more recognition for what she accomplished in the 1970s. HtN: Beyond those of getting such people on camera, were there any other particular challenges in gathering archival footage, photos … the kinds of things one needs in a sweeping historical biopic? BW: (laughs) Our eyes widened…”Oh, gee, could you send that on to us?” And a few weeks later, a DVD arrived in the mail, and it certainly helped animate her early story. I mean, I think one of the biggest challenges was that there was a lot of material. So, sifting through it and figuring out how to use it all, how to organize it, was hard. And Carla was brilliant at that, in helping shape the structure of the film. HtN: And she puts together some wonderful montages, too, at various points. I’m thinking of the opening one, of all the people who hate Justice Ginsburg: all those voices of loathing. It’s like, “How can you hate this woman?” I thought that was very effective in setting the scene, particularly since she now has that nickname of the “Notorious RBG.” So, I walked away from the film an even greater admirer of Ruth Bader Ginsburg than before, and I learned quite a lot about her, and I was a little bit ashamed of myself for wishing, during the Obama era, that she would step down, so that we could get a younger liberal justice in there. Because it’s up to her when she wants to retire, and I think you make that point well. Plus, would it have mattered, given what happened with Merrick Garland? BW: She has said that. She has pointed out the fact that President Obama might not have been able to get her successor through. HtN: This is very true. Nevertheless, in the film, beyond some peripheral discussions of how she’s going to retire, when she retires, did you ever sense her fears for the future, because we don’t know who might replace her? JC: You know, Justice Ginsburg is such an optimist, that even the phrase “fear for the future” seems a little incongruous. She has this way of accentuating the positive. That’s what’s gotten her through a lot of tough challenges in her life, and I think, when she looks forward, she talks about the pendulum swinging back, she talks about the long…you know, the Martin Luther King line about “the arc of moral history bending towards justice.” She’s going to see things positively. That’s her. HtN: Well, here’s hoping, because we’re in an age where it can sometimes be hard to see that. My final question, then, is this: why do you think, given how careful she’s been throughout her life, she let herself go, with her pre-election comments about Trump? It seemed a little out of character, in a way, for someone who has been so calculated. BW: We don’t know. We were surprised, and many of her friends and supporters were surprised, as well. HtN: Were you already filming at that point? BW: We were filming; we had just started. You know, I think she quickly realized that she should not have spoken those words, and she’s kind of moved on from there. JC: She was speaking about a candidate for President who many in the country were not imagining becoming the President. She said some things in a public way that she later regretted saying. BW: Yeah! She made a mistake, she admitted her mistake, and let’s move on. HtN: Which is more than some people do. Well, thank you very much. Congratulations on the film. It’s really a beautiful portrait of her.